We learn the most interesting things about our clients here at Memento Press. Who knew some of them owned race horses! Connie’s family ran a Kentucky Derby contender back in the 1950s. A portrait photographer took beautiful photos of their fine steed. Connie then had the shots matted, signed & framed. 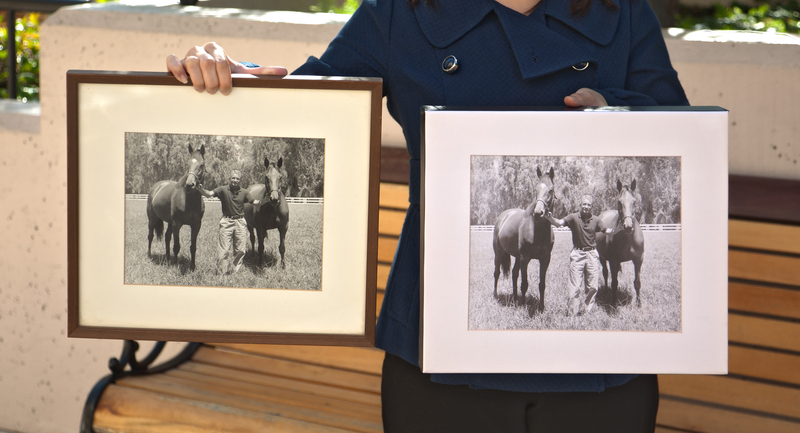 Of course, there was only one copy of each photo, and only one beautiful matte & frame. She wanted to share this family heritage with her grand-kids, for whom the pictures had been just a few of the dozens on her wall. But she did NOT want to destroy the frame & its lovely presentation. Yet a “low-price-leader” scan shop told her they would have to destroy the frame to get a good scan. Connie did not get where she is by being a shy and retiring. Over the years she really put us through our paces! As a result, we are her trusted advisors when it comes to her amazing trove of memories. Framed photos under glass pose a special challenge, since there is glare from the glass, as well as distortion based on a few technical factors. Due to the framing method, the photos could not be removed for normal scanning, without destroying the lovely original presentation of these heirloom images. And the frames were much too large to lay on a normal scanner. We suggested that she let us digitize the art, using a special glare-avoiding technique, designed just for large pieces of art. Then we would create canvas prints from the images. Our expert staff knew just how to handle it. The digitized images were well-lit, yet had no glare. After digitizing, we optimized the images in Photoshop, removing a bit of distortion, improving contrast, and matching color. We then created several copies of the images, printed on premium canvas. The canvas was stretched over internal frames, with hanging hardware attached & ready. The result was a set of terrific copies of her Kentucky Derby memories. She shared these with each household of her kids and grandkids. Connie was happy with the result, and we were happy to help. When I first saw the prints, I instinctively reached out to touch the beveled edges of the matte. Of course, it was an illusion, as the canvases are completely flat. But in that moment, the clarity of the image fooled me into believing it was 3D. Pretty cool. And even cooler was learning that Connie had a richer & more colorful history than we had imagined. This was a fun project for us. Her son dropped by last week, telling us how much Connie liked the results, and how much he liked his copies.